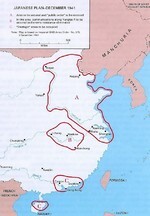 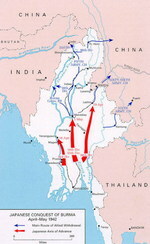 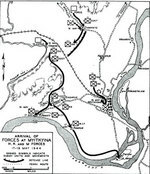 Map showing Japanese offensives in Dec 1941 Map of eastern India and northern Burma showing Japanese occupation and Allied supply routes in 1942. 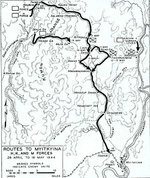 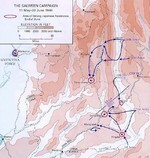 Note Burma Road, The Hump route, and the track of the future Ledo Road that opened in 1945. 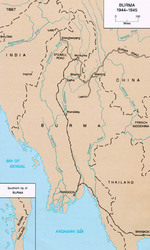 Map noting final Japanese lines in China and Burma between Operation Ichigo of mid-1944 and the end of the Pacific War Map of Burma in 1944-45 showing lines of supply by rail and by road. 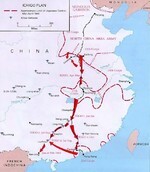 Note the Burma Road and the Ledo Road labeled as the Stillwell Road.